Four years ago, our very first blog post was on the topic of Masonic impostors. Each May since then, we've follow up with another post on the same topic. Our earlier posts looked at Masonic impostors in the late nineteenth and early twentieth centuries, but today we're going further back in time and looking at the subject of Masonic impostors in 1859. The Prudence Book of Freemasonry for 1859 was compiled and published by Rob Morris (1818-1888), a well-known Masonic author and book publisher based in Louisville, Kentucky. Morris was a high-profile Mason who wrote extensively and served in many high Masonic offices. Indeed, he was Grand Master of the Grand Lodge of Kentucky when The Prudence Book was published. Although rather mundanely titled and brief (64 page), Morris's booklet was ambitious. It sought to become a tool that could be used to identify non-Masons intent on imposing upon the good will and charity of Masonic lodges by posing as Masons in need of financial assistance. Morris gives many examples of Masonic impostors on the back inside cover (below, right) of The Prudence Book, including this colorful description: "Mr. A.G. Jones has committed depredations upon the fraternity in Decatur county, Ga. and other places. He is badly pock-marked, and quite loquacious. Beware of him." "You are cautiously to examine a strange brother in such a manner as PRUDENCE shall direct you, that you may not be imposed upon by an ignorant, false pretender, whom you are to reject with contempt and derision, and beware of giving him any hints of knowledge." This issue of Morris's Prudence Book was the first of what he planned to be six separate 64-page booklets, which collectively would do one simple thing: list every Mason in the United States (and British provinces). "But few remarks of a prefatory character are needed. The general call for a publication of this sort has become urgent, clamorous, irresistible. The Masonic periodicals all confirm it. Proceedings of Grand Lodges everywhere confirm it. My correspondence is filled with evidence of it. Hereafter, when a visitor calls upon you, it will be a matter of course to look for his name in the PRUDENCE BOOK. If not there, a satisfactory explanation of the omission will be expected of him. Hereafter, when an applicant for relief makes known his wants, you have something in the PRUDENCE BOOK which will strengthen or invalidate his claims; and if you are imposed upon in spite of this aid, you have the means at command to discover the fact, and avoid a second loss. Heretofore, you have had neither. And, by means of the PRUDENCE BOOK, you can trace out distant acquaintances, refresh your mind with the grand array of our noble Institution, far and near, watch its progress and career; and, when preparing to sojourn to other countries, carry with you, in a single volume, a Roll of the workmen nearly as large as that of King Solomon." 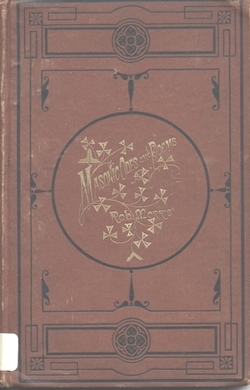 Although, in this first issue, Morris states that he intends to continue to update The Prudence Book every year, the whole enterprise still raises the question that dogged later Masonic organizations who tried to stay ahead of traveling Masonic impostors: can the information about who is and who isn't a Mason travel faster than the Masonic impostors themselves? Rob Morris. The Prudence Book of Freemasonry for 1859: Being a Catalogue from the Latest Official Data, of the Grand Lodges, Subordinate Lodges, and Individual Masons, Members of the Lodges in the United States and British Provinces, with the Seal of Each Grand Lodge: The Whole Affording a Means of Recognition and a Test to Try Impostors. Louisville, KY: Rob Morris, 1859. As blogs go, you won't find much opinion at ours, but I'm going to break that just for a moment to say that, as a poet, Rob Morris is no Charles Simic. Yet while Morris may not be to everyone's poetical tastes, that doesn't make him any less interesting as a historical figure. Like Simic, Rob Morris (1818-1888) is - or, rather, was - a poet laureate. While Simic is the current poet laureate of the United States (news-flash: Kay Ryan was recently named the new poet laureate, but she doesn't start until the fall), Morris was the Poet Laureate of Freemasonry. When first hearing this, I thought that perhaps Morris was a self-styled poet laureate, but, no, in fact, he was officially recognized as such at a ceremony that took place on December 17, 1884 at the Grand Lodge of New York in New York City. Only one other poet had been dubbed the Poet Laureate of Freemasonry before - Robert Burns. Yes, the Robert Burns. Most folks who don't read poetry have likely heard of Burns, and even if you don't think you know Burns's work, you do: he wrote Auld Lang Syne ("Should auld acquaintance be forgot..."). Burns, a Freemason, was made the Poet Laureate of Lodge Canongate Kilwinning No. 2, Edinburgh, Scotland in February of 1787. In an article entitled "A Successor to Robert Burns," the New York Times described the crowning of Morris as the new poet laureate of Freemasonry at a ceremony which included a procession marching to the William Tell Overture, as well as an actual crowning of Morris with a laurel wreath. Of course, succeeding Burns is, some might say, no small task, but if anyone was going to be crowned poet laureate of Freemasonry at the time, Morris seemed like the man to pick. Morris wrote and lectured extensively on Freemasonry. He also founded the Order of the Eastern Star and wrote its ritual. Morris's Masonic accomplishments are vast and it's difficult to understate his involvement with Freemasonry. His various affiliations and accomplishments are too many to list here. With which our sorrowing world is full. We have many works by and about Morris in our collection, far too numerous to list here. You can see what titles we have by searching our online catalog.